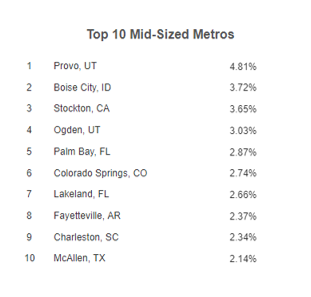 Recently released data from the U.S. Bureau of Labor Statistics show which mid-sized metros have the fastest growing economies. Growth is measured by the percentage change in employment between the annual average of 2016 and 2017. Headlight Data ranks employment growth for 55 mid-sized metros (500,000 up to 1 million people) in the U.S. In the fourth quarter of 2017, Charleston, S.C., however, topped the list in business growth according to Yelp Local Economic Outlook. In recent years, the Charleston region’s economy has been growing much faster than the national average. Construction, driven by rapid population growth and a housing boom, is a main driver of this growth.